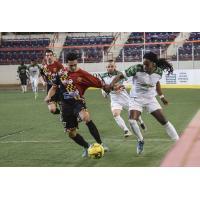 Baltimore, MD - The Blast record their thirteenth victory of the season with an 8-2 victory over the Harrisburg Heat. The Blast clinched a spot in the 2019 Ron Newman Playoffs with the victory today. Both teams prioritized possession in the first quarter, with no goals being scored from either team. The Blast created several opportunities, most of them coming from a power play early into the game. The Heat almost broke the deadlock late into the first quarter, as Ricardo Carvalho hit the crossbar from inside the box. The Blast got on the board first with Andrew Hoxie's seventh goal of the season from Jonatas Melo. Andrew Hoxie would get his second goal of the evening as he dribbled down through the Heat defense and fired a shot past the Heat goalkeeper. The Heat would answer back quickly with Patrick Thompson's fourth goal of the season. The Blast would hold onto the 2-1 lead as both teams entered halftime. The Blast would continue to create chances and found their third goal of the game through Tony Donatelli. Donatelli passed the ball to Sam Guernsey, who passed it back to Donatelli to finish the set piece play. Andrew Hoxie would collect his first hat-trick of the season as his shot ricocheted off a Heat defender and into the net. Adriano Dos Santos scored his tenth goal of the season later in the quarter to give the Blast a 5-1 lead going into the third quarter. Juan Pereira would open the fourth quarter with his fifth goal of the season. Midway through the fourth quarter, Adriano Dos Santos grabbed his second goal of the game to extend the Blast's lead to 7-1. The Heat would employ their sixth attacker for the last six minutes of the game. Adriano Dos Santos collected his hat-trick as he finished the ball on the empty net. William Eskay would score with one second left for the Heat, his tenth goal of the season. The Blast would record their thirteenth victory of the season, ensuring their spot in the 2019 Ron Newman Playoffs. Adriano Dos Santos led the Blast in scoring with four points off three goals and an assist. Andrew Hoxie also collected a hat-trick in the Blast victory. Four Heat players tallied one point in the loss. William Vanzela recorded fourteen saves in his twelfth victory of the season. The Blast are now tied for the Eastern Division lead with Utica City FC. The Blast come back home to SECU Arena for their final home stand of the season. The Blast will take on the Orlando Seawolves Friday March 22nd at 7:30 P.M. at SECU Arena.